The great-great-great-great granddaughter of Cornelius Vanderbilt takes a look at the decline of her wealthy blue-blooded family in this irreverent and wickedly funny memoir For generations the Burdens were one of the wealthiest families in New York, thanks to the inherited fortune of Cornelius "The Commodore" Vanderbilt. By 1955, the year of Wendy's birth, the Burdens had become a clan of overfunded, quirky and brainy, steadfastly chauvinistic, and ultimately doomed blue bloods on the verge of financial and moral decline-and were rarely seen not holding a drink. When her father commits suicide when Wendy is six, she and her brother are told nothing about it and are shuffled off to school as if it were any other day. Subsequently, Wendy becomes obsessed with the macabre, modeling herself after Wednesday Addams of the Addams family, and decides she wants to be a mortician when she grows up. Just days after the funeral, her mother jets off to southern climes in search of the perfect tan, and for the next three years, Wendy and her two brothers are raised mostly by a chain-smoking Scottish nanny and the long suffering household staff at their grandparent's Fifth Avenue apartment. If you think Eloise wreaked havoc at The Plaza you should see what Wendy and her brothers do in "Burdenland"-a world where her grandfather is the president of the Museum of Modern Art; the walls are decorated with originals of Klee, Kline, Mondrian, and Miro; and Rockefellers are regular dinner guests. The spoiled life of the uber-rich that they live with their grandparents is in dark contrast to the life they live with their mother, a brilliant Radcliffe grad and Daughter of the American Revolution, who deals with having two men's suicides on her conscience by becoming skinnier, tanner, blonder, and more steeped in bitter alcoholism with every passing year. We watch Wendy's family unravel as she travels between Fifth Avenue, Virginia horse country, Mount Desert Island in Maine, the Jupiter Island Club, London, and boarding school, coming through all of it surprisingly intact. 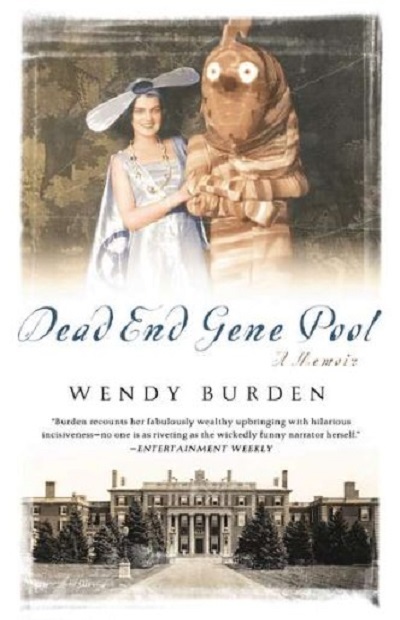 Rife with humor, heartbreak, family intrigue, and booze, Dead End Gene Pool offers a glimpse into the eccentric excess of old money and gives truth to the old maxim: The rich are different.